Plan ahead to make the most of your time in the Exhibit Hall. Use the Online Exhibitor Directory at ats19.mapyourshow.com to find exhibitors you’d like to see and to expertly navigate the Exhibit Hall. 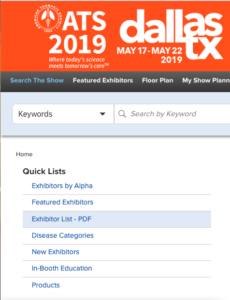 The Online Exhibit Directory is a convenient, interactive tool that offers you information about the more than 200 exhibitors showcasing their products and services at ATS 2019. You can search for exhibitors by alphabetical order. Or you can search by disease and product categories. Whether your particular interest is in pulmonary, critical care, or sleep medicine or whether you are a pediatric specialist or early career professional, the information you need is literally at your fingertips.